The Synthetics window is divided into several panels. 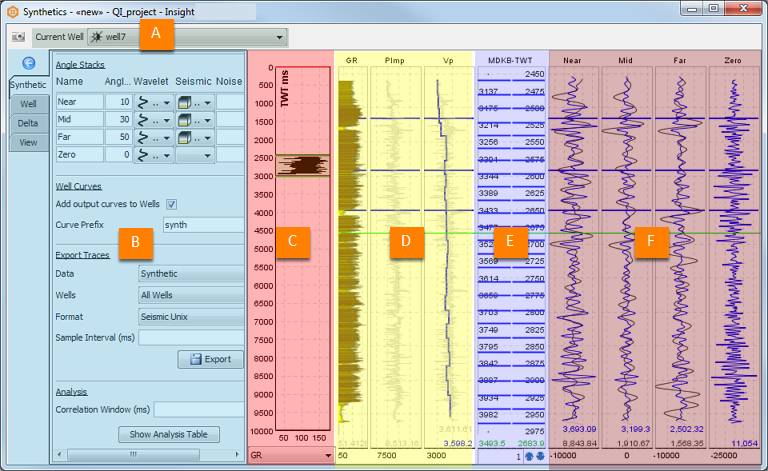 Select the well to display the log curves, checkshots and synthetics-seismic for the specific well. Switch across the different wells to update the display for the respective well. Configure the synthetics, well and display settings via the Synthetic, Well and View tabs. You can hide the Control Panel by clicking the left arrow icon or the tab that is currently opened to allow more screen space for the synthetics display. To show the Control Panel again, click any tab or the right arrow icon. Navigate to the well section for display by moving the green region or scrolling the mouse-wheel. You can also drag the top and bottom edges of the green region to zoom in/out of the well section for display. You can also zoom in/out the well section for display by right-clicking and dragging the region in the Well Log or Synthetics–Seismic Panel. Another way to zoom in/out the well section for display is by scrolling the mouse-wheel in any track in the Well Log Panel, Checkshot Panel or Synthetics-Seismic Panel. At the bottom of the Well Navigation Panel, select the curve to be displayed in this panel. Tip: You can also set the navigation range in the Well Navigation Panel. Right-click the Well Navigation Panel and click Set Range. In the Set Range window, type the values for the shallow and deep limits for navigation and click OK. This panel displays the well log curves in the tracks. You can define the tracks and curves to be displayed as described in Defining View Settings. This panel displays checkshots (blue lines) at the time-depth mappings based on the checkshot file of the well. You can edit the checkshots (see Editing Time/Depth Pairs).